“To teach is to touch a life forever”. 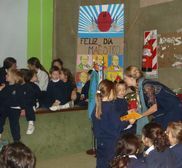 This year Miss Caro and Miss Celeste were in charge of preparing Teacher’s Day celebration at the Olivos Kindergarten. They honoured the teachers with a beautiful surprise prepared by the children and some of their mothers from the Tigers classroom. Miss Caro opened up the celebration in the Audiovisual Room in the Primary School welcoming the Tiger mothers who had prepared a surpise for all the kindergarten. They went up the stage dressed as kindergartners and teachers, and shared information about D. F. Sarmiento in a very fun and amusing way. It was very interesting to learn about why he is remembered that day. When they finished, The Tigers showed the surprise they had prepared which was a wonderful audiovisual about each member of staff. Children honoured their teachers watching it, trying to recognize who they were, and gave them a beautiful notebook made by them, a lovely plant and a red rose together with a warm hug. Thank you Miss Caro, Miss Celeste, Tigers and mothers. It was a lovely surprise for all of us! You can see more of the celebration in our Photo Gallery!